The first Ragdoll cats were bred in the early 1960s by Ann Baker, a Persian cat breeder from Riverside, California. Baker picked kittens out of a litter belonging to Josephine, a white-haired Persian/Angora semi-feral cat. Josephine had been sired by a number of males, apparently of Burmese or Birman origin, one of which bore Siamese markings. brown female. Baker mated Daddy Warbucks to Fugianna and Buckwheat to produce the first Ragdoll cats. Their bodies go limp when you hold them. 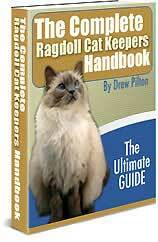 It was around this time that Baker began making eccentric claims about the Ragdoll breed. She gave at least three different explanations of the Ragdoll's unique traits: that Josephine's car accident had something to do with it; that the government performed secret genetic mutations; and that the cats were given to her by aliens. She also claimed that a rival breeder stole and killed a litter of her Ragdolls, even supporting her claim with a photograph of dead kittens. Breeders started their own association, the Ragdoll Fanciers Club International (RFCI), and by 1972 they succeeded in getting the breed registered in the NCFA. The Ragdoll has since become one of the most popular cats, recognized as a pedigreed breed by most associations. Despite her crazy antics, Ann Baker is credited with setting the standard look and temperament for the Ragdoll breed. Breeders Denny and Laura Dayton, on the other hand, are responsible for bringing the breed to international recognition. But Baker wanted all of the credit, and remained in constant conflict with the Daytons. The Ragdoll Franchise. At the time Baker began breeding Ragdolls, she was also experimenting with apple-headed lilac Balinese and black Persian cats. It was an outcross experiment to create blue or lilac (actually shades of grey and pale pink) Ragdolls, as she explained in a letter to Blanche Herman. In the same letter, Baker claimed that her lilac Balinese had been stolen, apparently mistaken for Ragdoll cats. According to her, 95% of the offspring had kinks in their tails, and her lilac Ragdolls were extremely light. Baker believed her experimental breed would give her an edge against the Daytons. Ann Baker was not a very skilled breeder and knew very little about genetics. Her experiment involved breeding a lilac apple-headed male Balinese to several female Ragdolls, then breeding the litter to Ragdoll males. But what she lacked in breeding skills, she made up for in business savvy. She turned part of her house into a cattery, giving cattery tours where, as expected, her Ragdoll cats took centre stage. Baker gave tours seven days a week, from one to five in the afternoon, charging $1 for adults and $0.50 for children. Breeding pairs cost $1,000 and franchises cost $1,500. The franchise later proved to be too much work for Baker, as it required setting up franchises in each state and having an attorney preside over everything. Baker discontinued the franchise in 1976, claiming it was too expensive, and that "it gave protection to the buyers like you would not believe, but absolutely none to the Franchiser". In the end, she only put up one franchise in Indiana for her friend Blanche Herman.